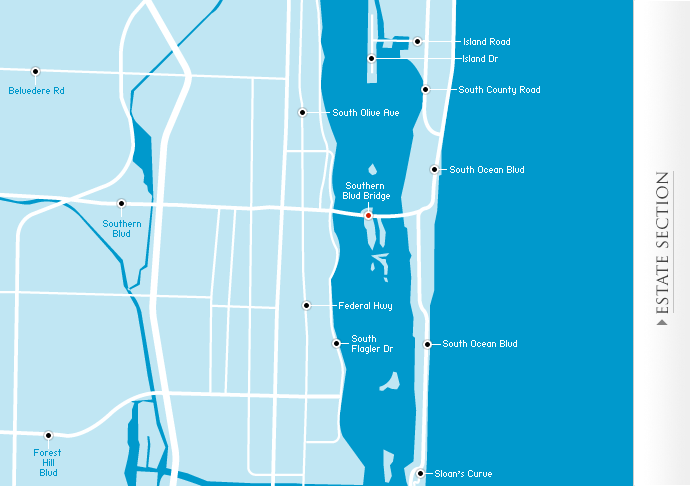 The South End extends from Sloan’s Curve to South Palm Beach. Waterfront condominiums built in the 70’s and 80’s form the majority of homes here, interspersed with some single-family homes. 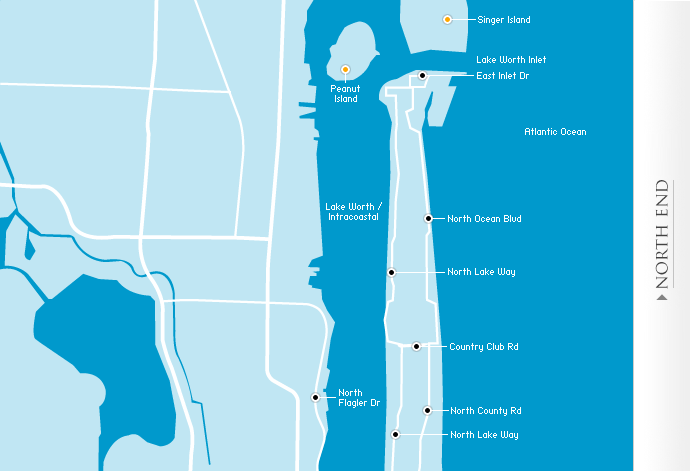 The Island is very narrow at this point, allowing views of both the Atlantic Ocean and Lake Worth/Intracoastal in many instances. A walking path on the western side of South Ocean Boulevard provides a great space for exercise. The Estate Section, as its name implies, is the area where the earliest grand estates were built for some of the towns most affluent citizens. Many homes were built in the first half of the 20th Century by architectural luminaries such as Maurice Fatio, Addison Mizner, John Volk and Marion Wyeth. Styles vary from traditional Mediterranean with stucco walls and barrel tile roofs, to classic Bermuda with white tile roofs, to curvaceous fifties Moderne. For the most part, zoning here mandates larger lot sizes resulting in the lowest density on The Island. In-Town properties are homes in walking distance to the two major shopping areas of Worth Avenue and Royal Poinciana Way. This area provides a unique blend of single- family homes, townhomes, condominiums & co-ops, close to boutiques & stores, restaurants & bistros, as well as schools & houses of worship. 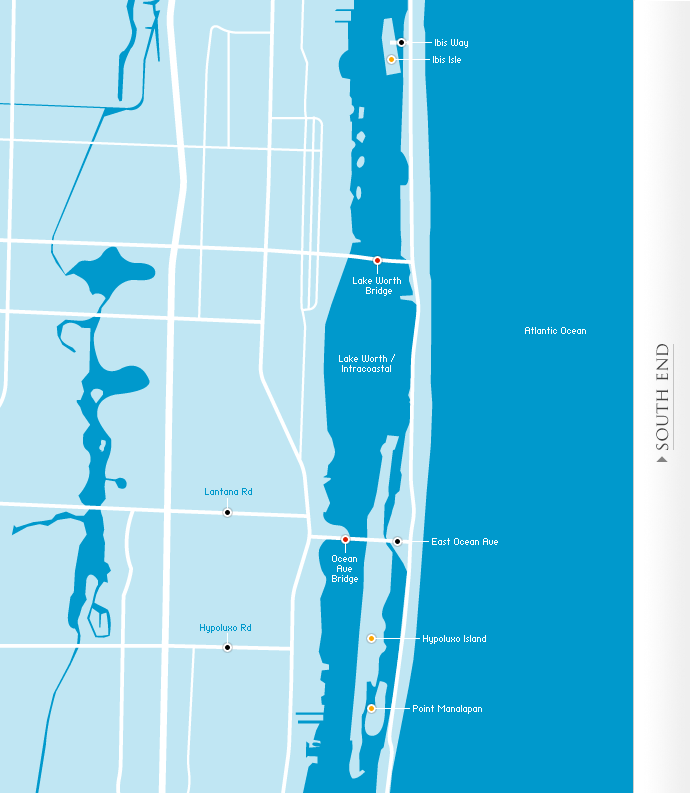 The North End is at the northern tip of the island of Palm Beach. This area is comprised of a variety of home-styles from smaller single-story homes to grand waterfront estates. The lot sizes are generally smaller than those in the Estate Section. Homeowners enjoy the quiet benefits of wide beaches as well as the Lake Trail for biking and walking. The North End has seen a recent resurgence of building under careful architectural and zoning restrictions, frequently replacing smaller homes with larger homes suited to today’s lifestyles. This is an area of single-family homes.